Folk music in Ukraine reflects the gains and traditions of the Kyivan Rus. These were many ritual songs sung a capella. 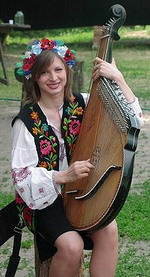 Historical songs (dumy) and kobza-playing appeared as typical Ukrainian folk genres in the 16th century. Independence has encouraged the development of all musical directions: Ukrainian song is being restored; there are new musical genre in popular music: Cossack songs and song poetry, Polissia magic pop, and Kolomiya rap. Numerous new festivals and competitions have sprung up, among which the most popular are the Tavriya Games. Opera art festivals, international organ and piano music festivals have become a tradition. Many of the dynamic and colorful folk dances of Ukraine also reflect a rural or Cossack lifestyle. The oldest dances are the "khorovody," agricultural dance games associated with the cult of the sun. Originally, folk dances were either accompanied by songs or by instruments. They were also exclusively female, such as the "metylytsia," or exclusively male, such as the "arkan;" today both males and females participate in the same dances. Numerous Ukrainian dance troupes cultivate the traditional folk dances.